The owl mandala is all about wisdom, psychic awareness and secret messages. The owl’s messages are heard on the wind and “seen” in the moon, trees and sky. You must look and listen carefully as her messages are secretive, meant only for those she is trying to communicate with. The addition of moon, tree and sky symbolism serves to clarify the owl mandala meaning. The owl symbolizes wisdom, yes, but she is also a symbol for mystery and mysticism, quiet intelligence and secrets. As she gazes with wide, all-seeing eyes, she holds what she witnesses very close to the vest. The owl is a symbol of messages and transition, too, but she is cautious about sharing her wisdom. She is ever careful to relay messages and share signs of transition only to those who need to know. Owls are the symbol for protection for souls who are transitioning from this spiritual plane to another. According to ancient Celtic, Egyptian and Hindu lore, the owl is the guardian of the underworld and protector of those who have passed on. She was believed to rule the night as the “Seer of Souls,” accompanying people’s souls and providing protection as they made the journey to other realms. Native Americans believed owls represented foresight and wisdom. They were the keepers of sacred knowledge, sharing that knowledge judiciously through an oracle of secret knowledge during special ceremonies. Native Americans commonly looked to the majestic owl for weather predictions. Art and jewelry made with owl mandala patterns impart all of that wonderful owl symbolism. Owls, in general, lend themselves well to art and jewelry. They are beautiful birds, after all, that are very symbolic and always interesting. Owl mandala jewelry and art may include feathers. They give the piece a wonderful Native American look and bring additional symbolism to owl mandala patterns. Feathers represent ascension into other realms and evolution into higher planes. An owl mandala that includes feathers symbolizes communication with spirits and celestial wisdom. Owl symbolism in jewelry and art is greatly enhanced when the phases of the moon are included in the design. The owl’s nocturnal activities in the role of “Seer of Souls” and guardian of the underworld are enhanced by moon symbolism. Owl mandalas are often made into necklaces or pendants and earrings and owl mandala art can be put on nearly anything. From wall art, T-shirts and I-phone covers to coffee bean grinders, owl mandalas can be simple or complex and colorful or muted. Owl mandala coloring is extremely relaxing and therapeutic. 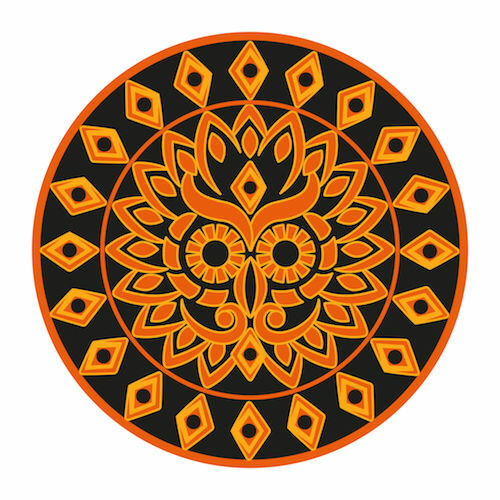 The owl mandala design can be as complicated or plain as you like. Include other symbols in the patterns or create mandalas that are all about the owl. 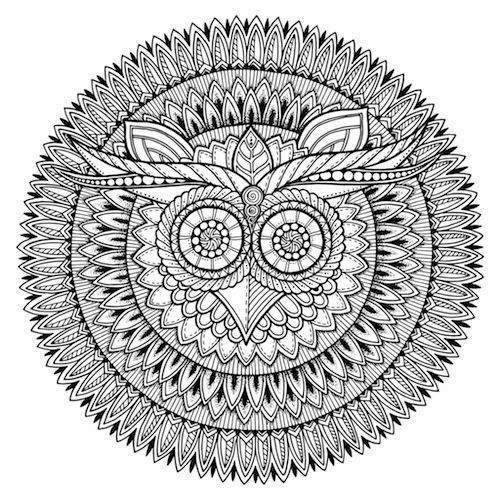 Owl mandala coloring books and mandala coloring pages can be found online for a small price or, in some cases, for free. Mandala coloring sheets and books are available on Amazon, Etsy and other sites. Owls are fairly easy to draw yourself, if you are artistically inclined or even if you aren’t. Drawing the owl mandala yourself, if you don’t think of yourself as “artsy”, can be a wonderful psychological exercise. Just sit down with your colored pencils, paper, compass and ruler and see how creative you can be. You may be pleasantly surprised. If you are unhappy with what you design, it’s no big deal. Start over or print out or buy some online mandala coloring pages or a mandala coloring book. Make your owl as colorful as you like or just use one or two colors. Experiment with some light and dark shading if you want to and don’t be afraid to add other symbols to your design. The freedom to color your mandala any way you like is a big part of the therapeutic value of owl mandala coloring. Owl mandala tattoos, like owl mandala art, can be as colorful or muted as you like. The tattoo can include only the owl’s head, the entire owl within the mandala or, for a slightly different look, the owl clutching the round mandala in her talons. The round mandala can also be positioned as the owl’s body with its head affixed to the top. Really, the sky is nearly the limit with owl mandala tattoo designs. Mandala images always work best on large, flat body surfaces like the back or chest. However, owl mandala tattoos can be scaled down or designed to fit on the shoulder, upper arm or thigh. They are much easier to appreciate, though, when the owl mandala images can be viewed easily at a glance. When they are placed on an arm or leg, you may have to lift or turn your arm or leg so that the person looking at it can see the entire mandala.